How is your knowledge of Fortnite’s map? This is what the highest elevation challenge introduced in Week 6 asks of you. There are five points in the map that now have a sign that shows you just how high you are compared to sea level. There won’t be any surprises as to what the highest point of the map is, but some locations aren’t completely obvious. 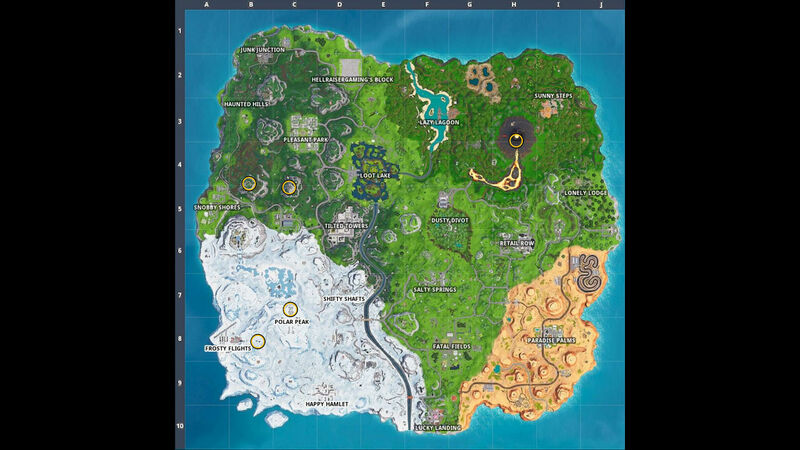 This guide will go over all of the five highest points in Fortnite’s map you will need to visit to complete the challenge, and if there are any key defining features for each of them. Situated on the southern-side of the volcano, close to the border at Grid Reference H3, this sign can be a little tricky to land on. My advice here is to use the volcano as elevation, then descend onto the southern cliff face. There is a sign nearby that you merely need to stand next to in order for the tracker to trigger for that location. The big castle that dominates the Polar Peak region is where you need to land for the second high point. You’ll need to drop down onto this one to nab the second point quickly, especially as this is a semi-popular area for looting in the early game. Luckily you only need to be nearby the sign, towards the western side of the top of the castle, to have successfully visited the area. Just to the south-east of Frosty Flights, there is a submarine that’s marooned on a snowy peak. You can either land here or somehow build your way to the top, but you shouldn’t encounter too many players in this area. This also has the added benefit of being close to a healthy supply of vehicles in case you need to get to another location quickly. One of two mountains you’ll need to climb, this one has a rather steep ascent that it’s probably better to just land on it from above using the Battle Bus. The final one is to the east of the previous drop point, which is on the line between Grid References C4/C5. The mountain is tricky to climb on its own, so is therefore another one I’d recommend falling onto from the Battle Bus. You’ll find plenty of Driftboards and even a chest potentially on the mountain. This concludes our highest elevation Battle Star location guide, but there’s plenty more challenges to complete in Season 8. You can find out where to find the location for the area highlighted in the magnifying glass in our Fortnite Treasure Map loading screen Battle Star location guide, or the knife in our Fortnite Treasure Map loading screen knife location guide.